So this weekend just gone we finished the Pathfinder campaign I've been DMing for the last few months. It went off with a bang! You can see my previous post on the whole business here. In commemoration of this I decided to make a post featuring my redesign of the campaign setting's Big Bad, Elessia. Spoilers on the campaign progression/ending below! 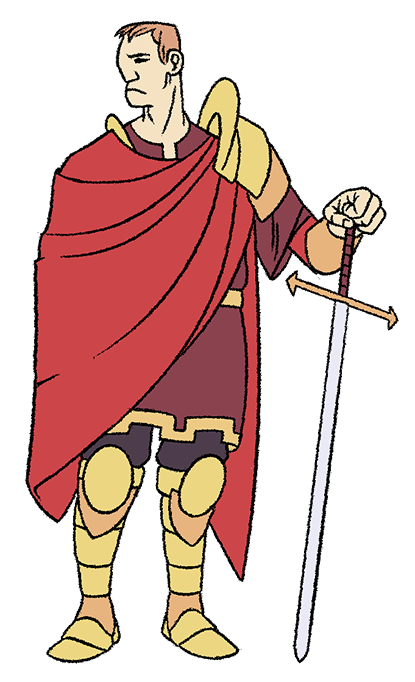 Elessia, though barely 20, is a wizard of no small power. Orphaned by the Nirmathas-Molthune war, she was taken in by a guild of Nirmathan mages after showing surprising amounts of innate magical ability (perhaps owing to non-human ancestry - she was almost certain her mother had been at least an elf, possibly something worse). By the time she came of age, Elessia was certain she had pinpointed the fault for the destruction of her family: the belligerent and expansionistic nation of Molthune, whom everyone knew had instigated the war in the first place, and its star Captain, a brutal man named Pavo Vos. Elessia knew that she could never stand toe to toe with the full might of the Molthune army alone - but with her startling (almost inhuman) ability to dominate or destroy the minds of all those she met, she set out with a handful of stolen magical artifacts to install herself as a spy in the Molthune ranks, who would destroy the country from within. Elessia's name and role are taken pretty much as written from the Fangwood Keep module - a tricksy magic user who fights indirectly using enchantment and illusory magic. The character is written as an evil cleric - however, I changed her up in a few ways; mostly for the sake of it, but also because the villain in our previous big campaign (another Pathfinder series, The Price of Immortality) also happened to be an evil-god-worshipping lady, and I kind of wanted to do something different. I ended up writing Elessia more like a player character, with a traditional they-burned-down-my-village sobstory that had provoked her to just take the reins of life in order to ruin her perceived antagonists wholly and conclusively. She had a particular thing against the military, and given that the party were all from the Molthune army this gave her a good reason to specifically try and do them in. The party itself was actually over-leveled (6 of them in a campaign meant for 4-5) and had been having a moderately easy time of killing hobgoblins, so i decided to make Elessia a lot more powerful. I gave her 8 levels in Wizard, giving her access to lots of fun mind-affecting spells but very little actual combat ability. She used mostly illusory/enchantment magic, so the idea was that the party would have to think their way around a lot of trickery to get to her but, once revealed, she was actually very weak. We had a fun fight involving lots of Naruto-style illusory clones (Major Image) and party members fighting party members (Dominate Person), all the while with Elessia running around under Greater Invisibility. But they got the better of her in the end! In the end, the death toll was pretty low - all but one of the party survived, although in order to escape they had to run through a busted planar portal which scattered most of the party across several different randomly-decided dimensions (I did a little epilogue for each). The one PC that died was the numerically-named "27" - he got swallowed whole by a Gibbering Mouther summoned by Elessia just before the portal cut out and, having nowhere else to go, decided to go out with a bang and blew himself (and the mouther) to smithereens with a pellet grenade. RIP 27. I love cameos so I'm sure we'll see the other PCs again. Everyone did a drawing of their characters so I'll have to find them all and post them here so you can see what they looked like! 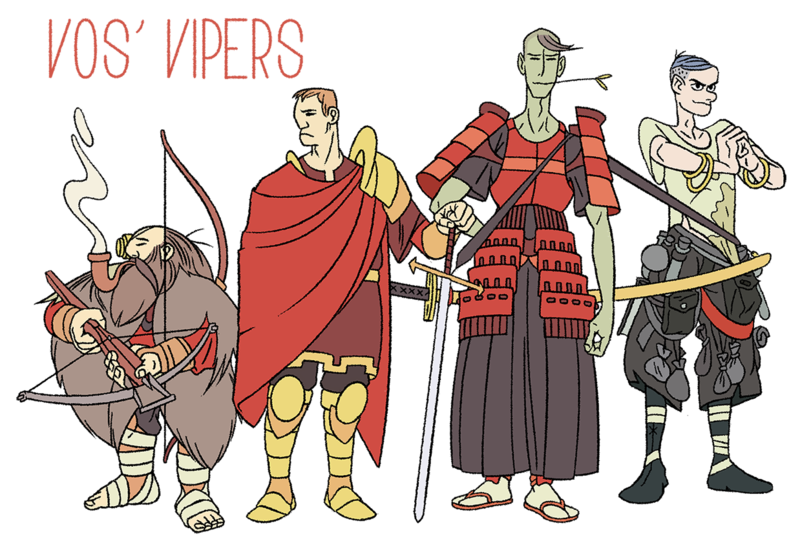 Anyway, I did some coloured versions of Vos' Vipers (now deceased), so I thought I'd post them too. You can buy a pdf of the Fangwood Keep module straight from the Paizo website. I'd recommend it, the mix of sandbox-style exploration with classic dungeon crawling was really fun! Next campaign I run is going to be written completely from scratch - I'll let you know how it goes.